I walked to town and back this morning. I wanted to buy a book about seaweed. Failure. I looked in the library too but the only book about seaweed was illustrated with drawings - and I wanted photos; photos so I could be sure of what I had seen the day before. The sea has been churning up seaweed.It's what it does at this time of year. In some places the waves pile it high like bonfires. In others, it arranges it in deep in deep, huge, flat carpets. Elsewhere, almost every bit is distinct and separate, or gathered and grouped but in clear, small lumps. I took these photos yesterday (12th October 2010.) I could hazard identification but I'll not put labels until I'm not sure of them all. This, I suggest, is no worry. Seaweeds look just as interesting, just as beautiful, whether you know their names or not. And a leaf from that group close to . . .
More - like red worms . . . Almost limitless in variety . . . Sometimes, beautiful . . . sometimes slimy . . . (but still beutiful!) . . .
Non- stop seaweed . . . some small scraps (see the footprint next to the one below) . . .
in endless styles . . . In the sidebar, there's a link to the Natural History Museum's UK seaweed survey. See if you can take part! And there's a bonus picture on Pictures Just Pictures. The little yellow snail sitting on the seaweed is less than half an inch long. One day, I'll remember to take a ruler when I go out walking! You've brought a science fiction image into my mind, Barbee - that you wake up one morning and look out of the window and there's seaweed in your garden! On a more serious but equally bizarre note, someone who lives by the beach where I took these photos looked at my post and made the same comment - that he hadn't realised how colourful and interesting seaweeds can be. 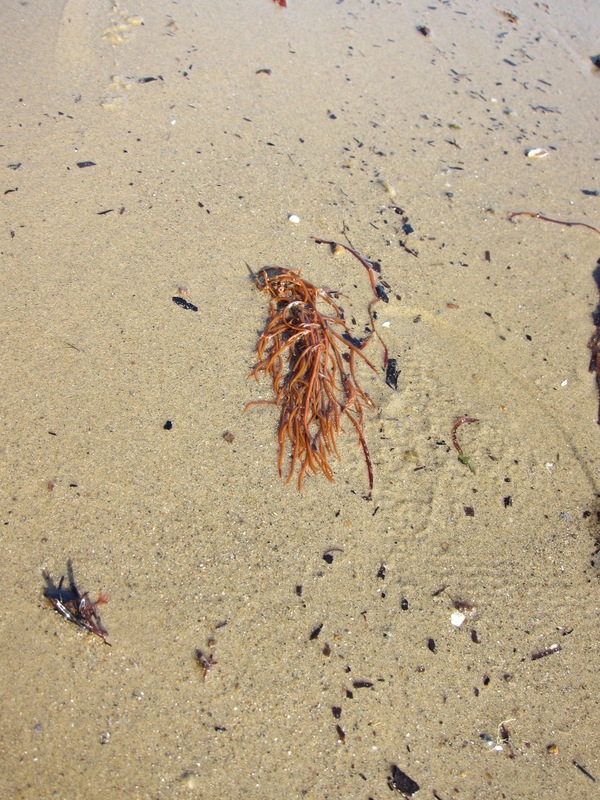 Mostly, I think we look at the sand and the water, even at shells, and seaweed gets ignored. Strange. On the other hand, although there are seaweeds growing on the rocks, there's little strewn about like this during the summer months. Have a cold, but enjoying reading blogs during my down time. Loved the science fiction idea! Now about the beauty: I think it is the eye of the photographer that saw it and used her skill in recording it so that others can see what she saw. I probably would have just stepped over all that and walked on, blind to the beauty you saw. Thank you! Nice photos Lucy! Being a (former) scuba diver, I was always amazed by how beautiful seaweed and kelp is underwater in it's element. Lucy I think if I lived near the sea like you I too would love to be able to ID different types of seaweeds etc that can be found on the beach. Each type looks lovely in its own way as it drapes itself across the sand. Such wonderful shapes and colors; I always thought of seaweed as a bloggy green thing (like cooked spinach). These are lovely, Lucy. I'm very fond of seaweeds, although on this shore the main types are dulse, rockweed and laminaria. I have photos from beaches on the Atlantic shore of the province something like your photos, looking like some sort of abstract art. Gorgeous. How much colour can you see underwater? I bought a fungi identification guide a few days ago ready for the coming season. Some seaweed is pretty yeuch. 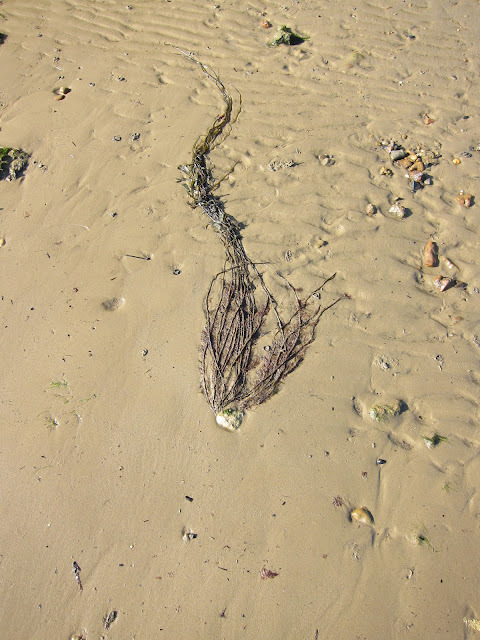 There's one called Sea Lettuce which looks like land-lettuce leaves gone slimey (only a much brighter green). I have pictures of it but not on this post. I'm really pleased with these pictures and am glad you like them too. As long as there is good light, it can be very colorful. the deeper you go, the less light, and therefore the less color! Your pictures are beautiful, it's really nice to see what live in the sea.